Francisco Saavedra fabricates a template to scale with large-format, Designjet printers from HP. The tree house is composed of three main cocoons in concentric circles making up a clover shape that provides a private play space for each girl. Working in Rhino, the architects emulated the geometry of a bird’s nest by magnifying the twig components into larger branches of wood. At one point, Salinas said the team considered Corian for the entire structure, but wood was a better logistical choice as LED lighting, power, and data were integrated into the design. Final Rhino files were converted to AutoCAD and sent to a large-format HP Designjet T920 printer. Templates were printed on paper in a 1:1 ratio, and used to cut the forms out of MDF. These hard templates were then laid over wood planks to fabricate the final ribs. The architects chose the wood of the Salam tree because it is certified to originate from a regulated forest, an assurance that Salinas said is not easy to find in Mexico. The timber variety also weathers well against the elements and is sealed with wax for added durability. To install Casa del Arbol, Salinas forewent the predictable wood-and-nail method. Steel plates attach to the ribs with stainless steel screws to prevent rotting. This self-securing method also gives the structure an appearance of floating within the trees and reduces direct impact. For privacy and comfort, panels of treated fabric will be secured to the vertical ribs. Architectural photographer, Adrian Wilson, shared this photo with AN that he snapped during a photo shoot in Mexico City today. The routine work day, this time at Casa Palacio for Jeffrey Hutchison & Associates, was abruptly interrupted by a magnitude 6.1 earthquake epicentered some 250 miles outside the Mexican capital. It was once instance, the usually-steady Wilson said, when he "couldn't avoid camera shake…" According to news reports there was no major damage or injuries reported from the tremor. Rojkind's firm worked with industrial designer Héctor Ersawe to plan the new 6,800-square-foot location for Tori-Tori, a popular Japanese eatery and one of many restaurants that moved or expanded into the recently rezoned Polanco area. Though some establishments have opted to simply hang out a shingle advertising their new presence, Rojkind's team wanted to create an entirely new environment that would tie the restaurant's interior to the outdoors. The new steel facade was digitally designed to mimic the vegetation that covers the project's retaining walls. Outside floor-to-ceiling glass, the grid structure wraps the south and west elevations of the restaurant. It extends from the ground to the roof in a pattern designed to give diners a view of outdoor patios while casting shadows on the interiors depending on the time of day. The facade's self-supporting layers are made with CNC-cut, thin-gauge steel plates that were welded in place on site and hand-finished by a team of nearly 40 local metalworkers. Slightly offsetting the layers and painting them two tones of gray add to the illusion of movement, and, lest diners forget they are not just enjoying a meal in a neighbor's lavish courtyard, blue LEDs positioned between interior and exterior layers add a touch of electricity to the air. 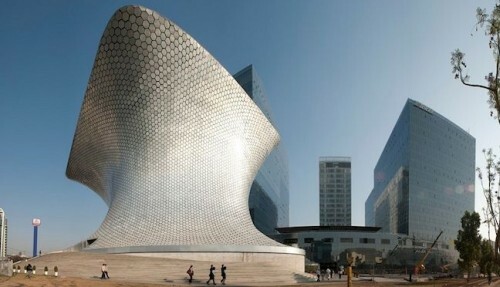 Mexico City's new Museo Soumaya (named after the deceased wife of Carlos Slim, the Mexican billionaire who owns the museum) was finally unveiled to the public late last month. The museum houses 60,000-square-feet of continuous exhibition space spread over six levels and containing over 6,200 pieces from Slim's art collection. 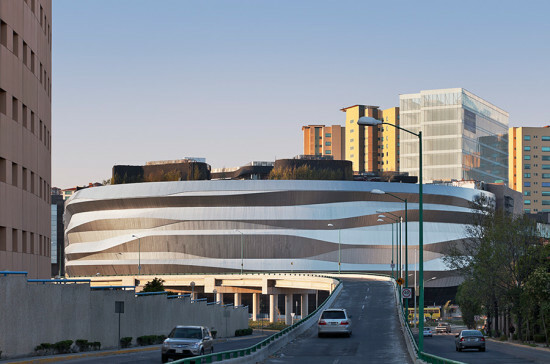 Designed by Fernando Romero of the firm FREE, the building is shaped like a woman's bustier with a cinched waist. The amorphous structure is built with 28 curved steel columns of varying diameters, each with its own contoured geometry. While the exterior mass resembles a singular object, the skin is comprised of thousands of hexagonal aluminum modules. While the building itself is almost opaque--it has no windows--the roof of the top floor is suspended from a cantilever, letting in natural light. The result is a monumental parametric design offering a dramatic sculptural addition to the city once celebrated for its tradition and hand-painted, colorful architecture. The restaurant La Superior in Williamsburg, Brooklyn is small place with very high standards. Not only does it have the best tacos and salsa in the five boroughs, but its low-cost décor features design elements by Mexican engineer/designer Ricardo Cid that are as exciting as the food. Cid, from Mexico City, claims he always wanted to be an artist but one that used “different and more complicated tools and calculations,” so he studied engineering at Mexico City's UNAM. The university gave Cid a research grant, and he used the money to move to New York City and begin an independent research practice focusing on “old and lost methods of Mexican manufacturing,” and adapting them to new materials when the old ones could not be found. 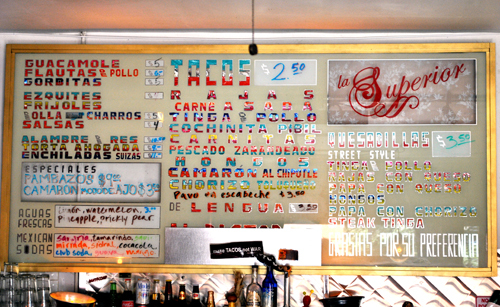 On the wall behind the bar where Superior owner Felipe Mendez mixes his superb margaritas, Cid created a crystal and mirror menu board from a process called “rotulo dorado” found in Mexican cantinas and taquerias in Mexico in the 1940s. The process was originally used by local craftsman called rotulaeors to produce signs that display “menus, rules, and things to remember.” Here, Cid replicated the glass board process by tracing a letter or figure with appliquéd golden tape, many with saturated colors, metallic textures, and pearled finishes. Cid has also designed wallpaper for Superior that replicates an old method of Mexican printing, again from the 1940s, which he says “is not precisely block printing but a combination between screen printing and matching.” What drew me to Cid’s extraordinary work was a tournament bracket showing the teams competing in last month’s World Cup, looking like some kind of contemporary Aztec calendar with geometric shapes in forced perspective. The bright red plastic in this football piece is another application seen in street markets and cantinas in Mexico City, where Cid says “it’s pretty common to find entire walls of colorful volumes that make no sense, but call the attention of the eye in a very ‘Naco’ style.” Naco, he claims, means something like tasteless, but with style at the same time. It’s not precisely kitsch, but is meant to make things more beautiful. 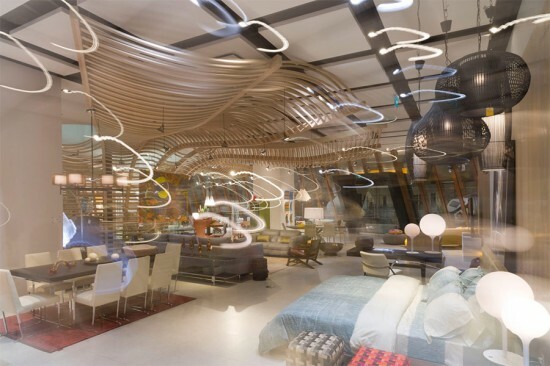 The La Superior space is not necessarily exciting as an interior, but if you look around, it offers fascinating hybridized design elements that are the best of young new Brooklyn design.